We are living in a highly competitive world where making a first impression has become vitally important. The business environment has become a saturated fireplace where people are constantly being put through an acid test to prove themselves. Creativity has always held an edge in this scenario because a good idea is hard to forget. Business cards are highly representative of your ideas and approach to business which is why it is always a good idea to be creative in this area. Here is a list of 20 business card designs that are unique and should help inspire you to do something different with your own. 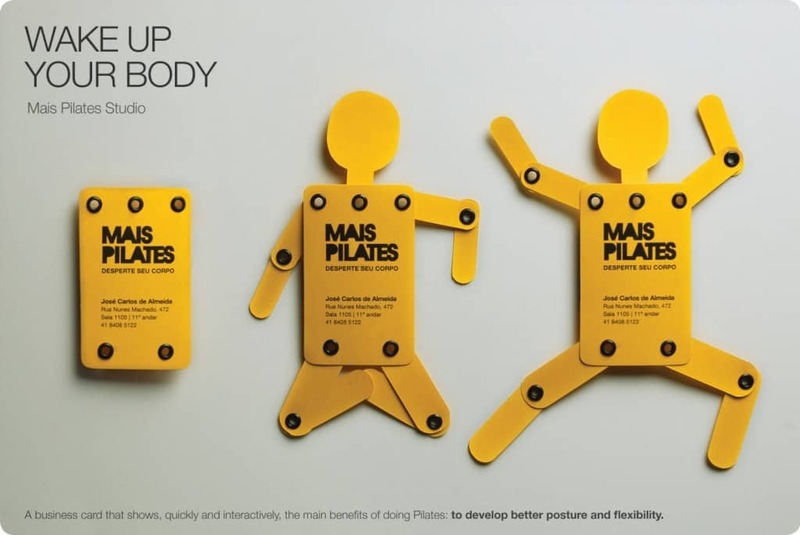 This Pilates class decided to try a distinctive approach by making their card as flexible as the service they intended to provide. 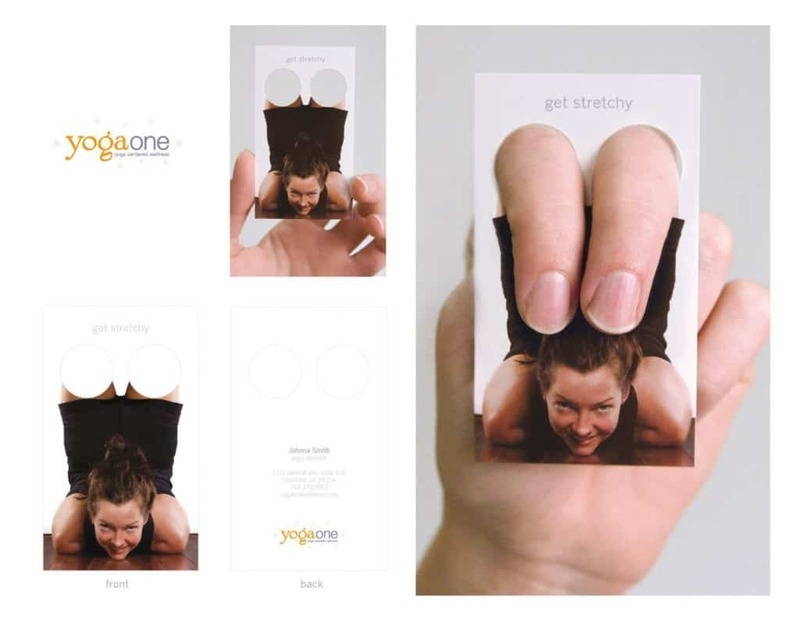 You can see that the card looks fairly straight-forward at first but has the option of unfolding into a person practicing Pilates. This card should have you thinking about business and fitness the first time you see it and that is exactly what they were going for. 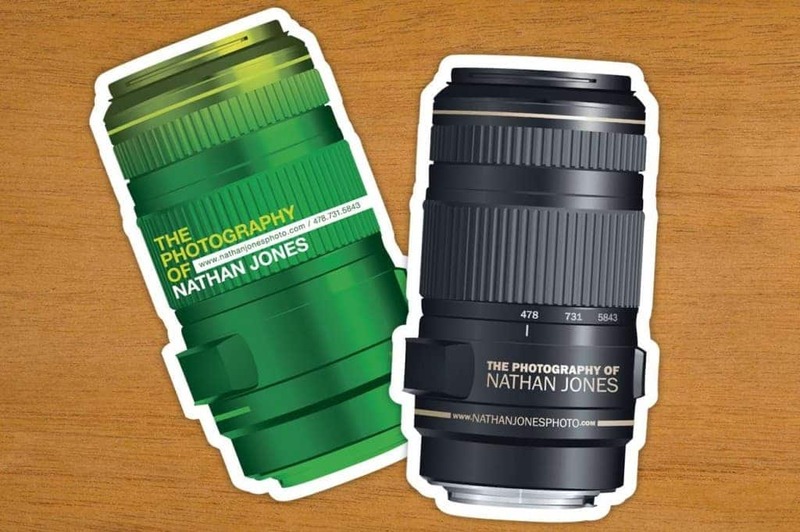 This is a stylish and well-designed business card that relies on high-quality lens instead of a traditional camera to make a point about quality. Its unique design makes it easy to remember too. 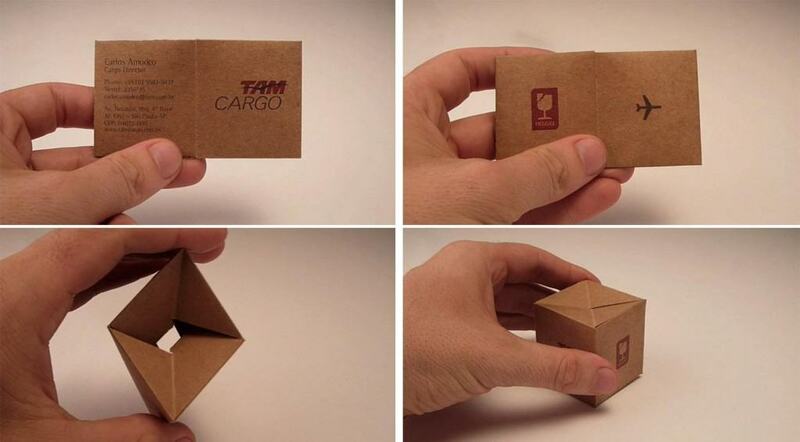 This business card of a cargo delivery company is nicely done and delivers a fairly straight-forward message. The use of the right color and texture for the card makes it even more effective when the original business card is folded to create a delivery box. Clark and Kent is not a particularly unusual name for an ad agency but its employees decided to derive the most popular meaning from the name to make an association to ‘Superman’. This business card folds into a telephone booth, the one place superman turns to for a quick costume change. 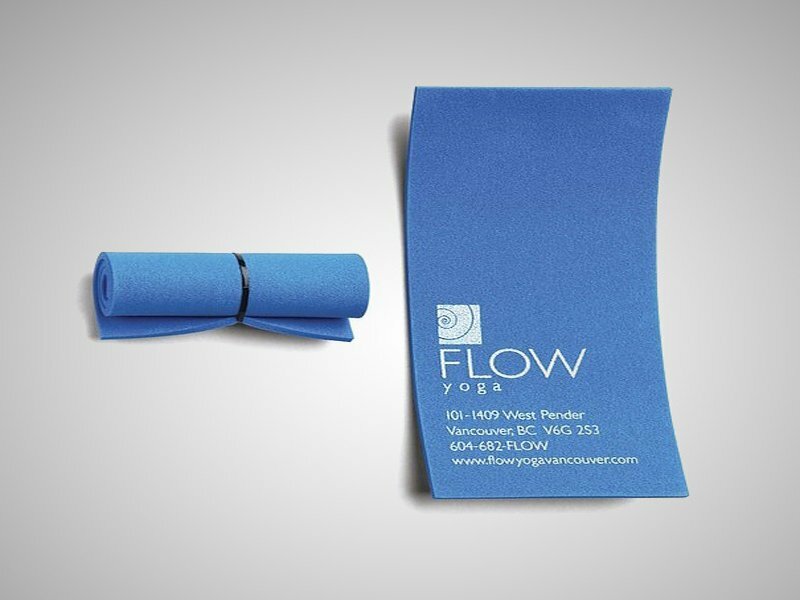 Making your business card utility friendly is the perfect way to make people carry your card around a lot longer. This bike repair store add a tool at the end of the their card to help people actually repair their bikes to a small extent and think of their business while doing so. Adding an element of interaction to your card is another light and easy way to make your business stand out from the card. This Yoga center did just that by simply using their own service as inspiration. Being in the entertainment industry is a great way to meet new people and this happens organically itself. When you meet other industry professionals, it is always a good idea to make a strong impression. 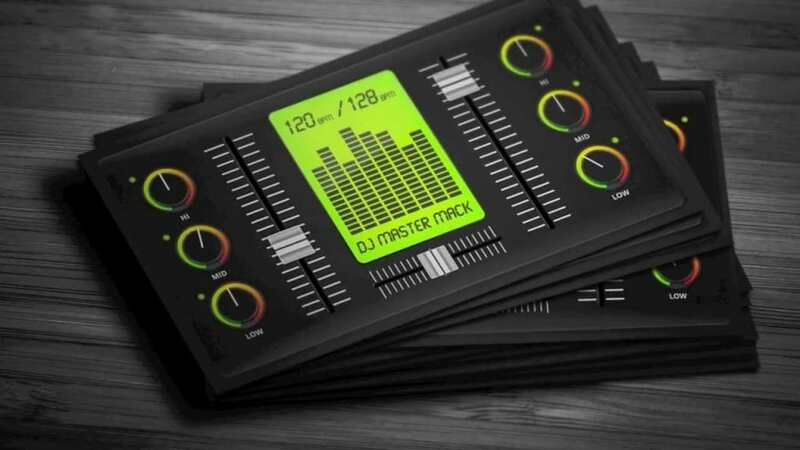 This DJ had the right idea by turning his card into a console. Another great way to make your business stand-out is by offering free samples of your product or service and let the market forces decide for themselves. 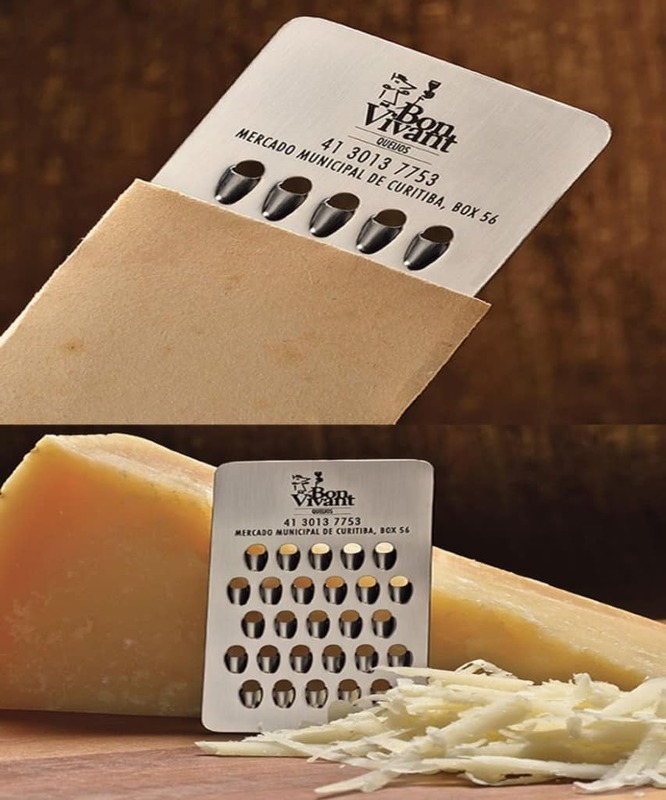 This cheese grate manufacturer managed to turn a seemingly ordinary product into a reliable source of marketing by converting it into a business card. 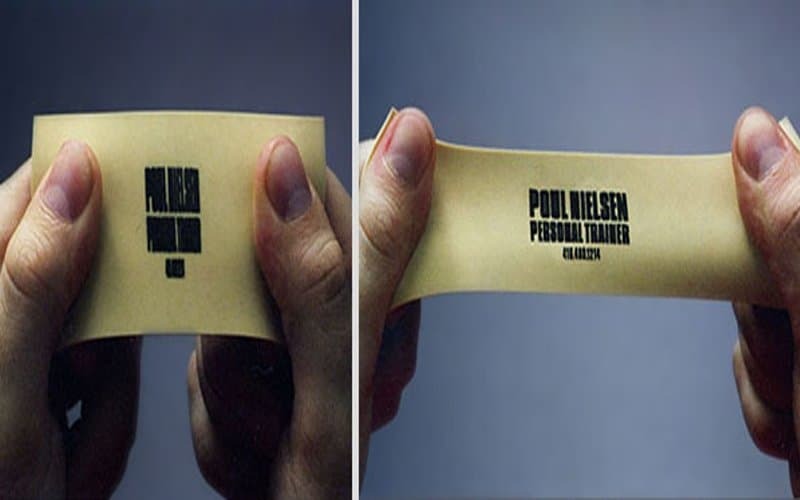 This genius idea was converted into an effective business card by simply using a rubber band and the right material for the card. The Yoga mat manufacturer could get their name out with greater ease thanks to a simple re-invention of the wheel. 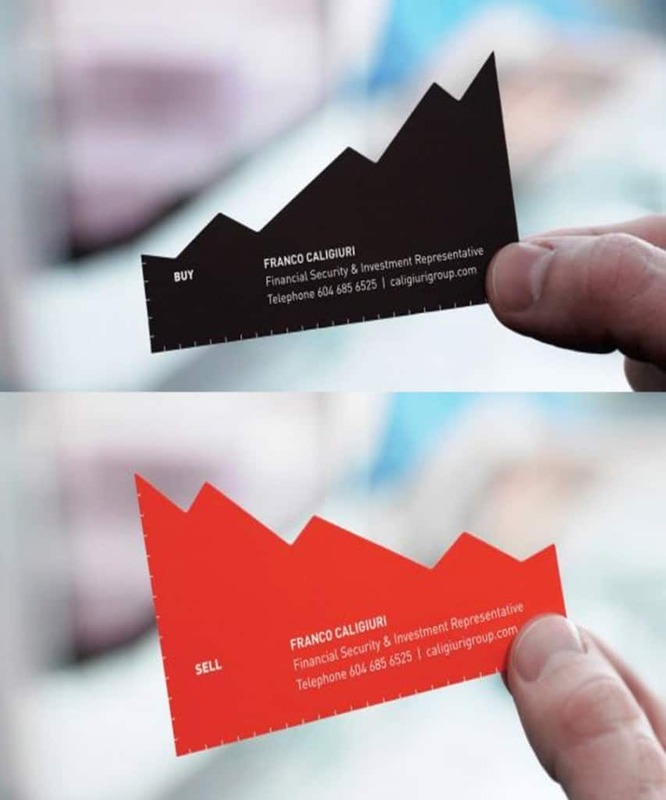 This is another great example of a business card used to highlight the company’s product. 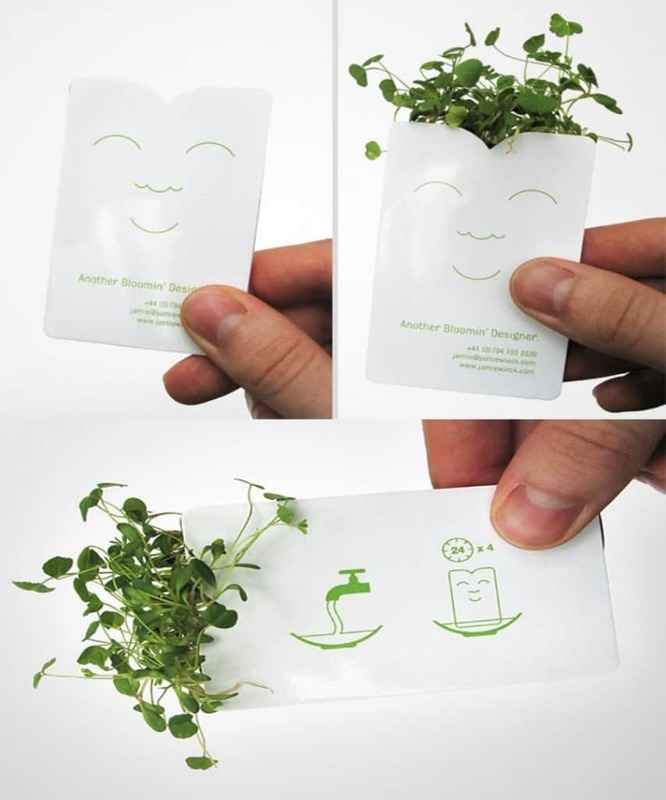 For a seed packet manufacturer, creating a card that could double up as a mini-version of their product was a superb idea. It is not always about taking the direct approach while creating a unique business card. 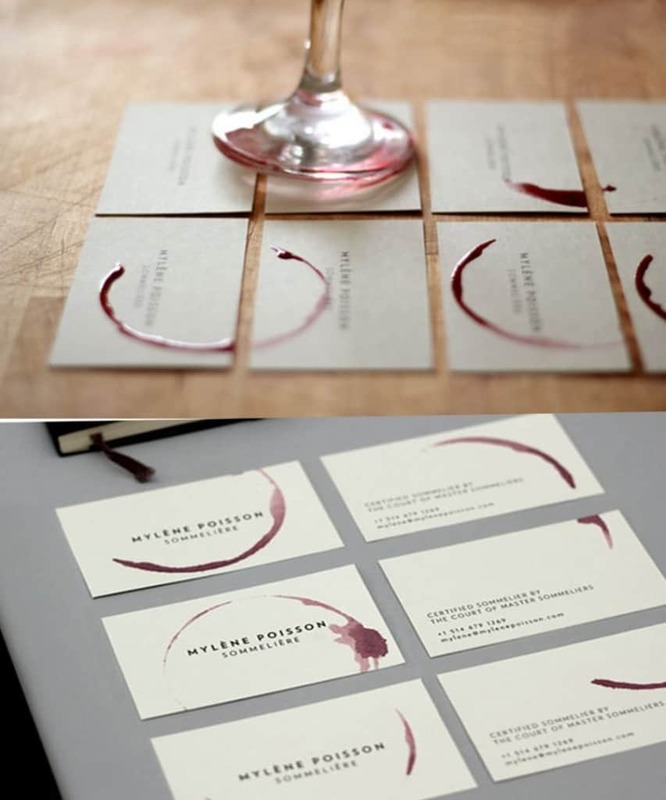 This Wine Glass manufacturer used an associative method by creating a business card that relied on wine stains to create a design element on their card. The end result is both aesthetically pleasing and highly effective. 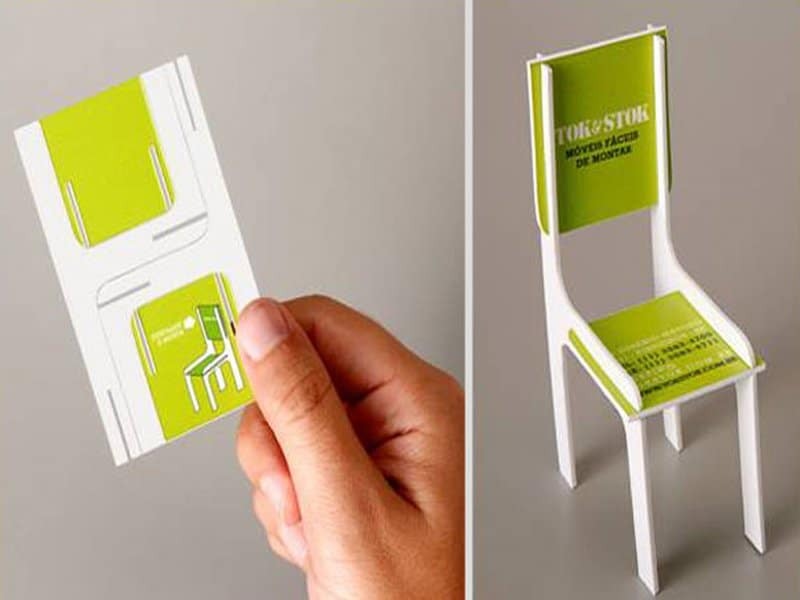 This chair manufacturer managed to highlight the many areas involved in producing their chair while also delivering on personal details, simply by making their business card interactive. Branding your business well can be more useful for a company than most other sources of marketing. 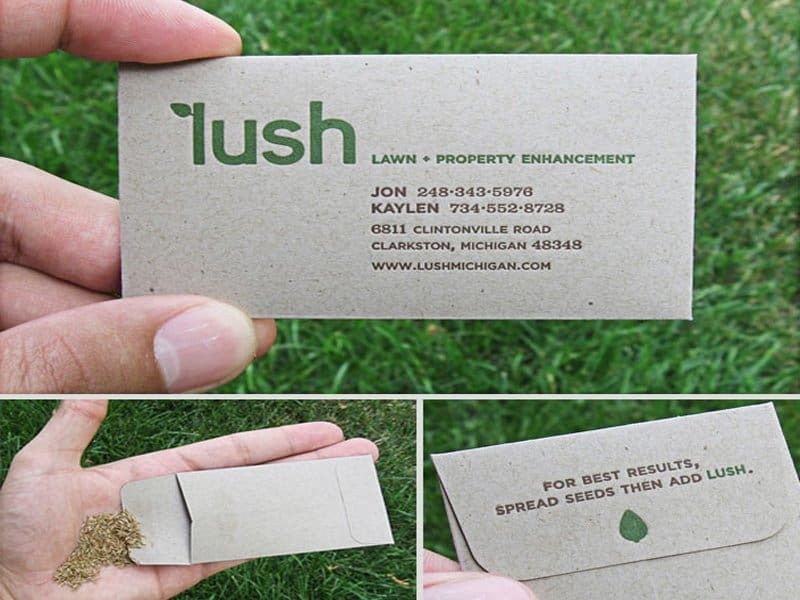 This lawn enhancement company used their visiting cards as sample bags in order to spread awareness the right way. 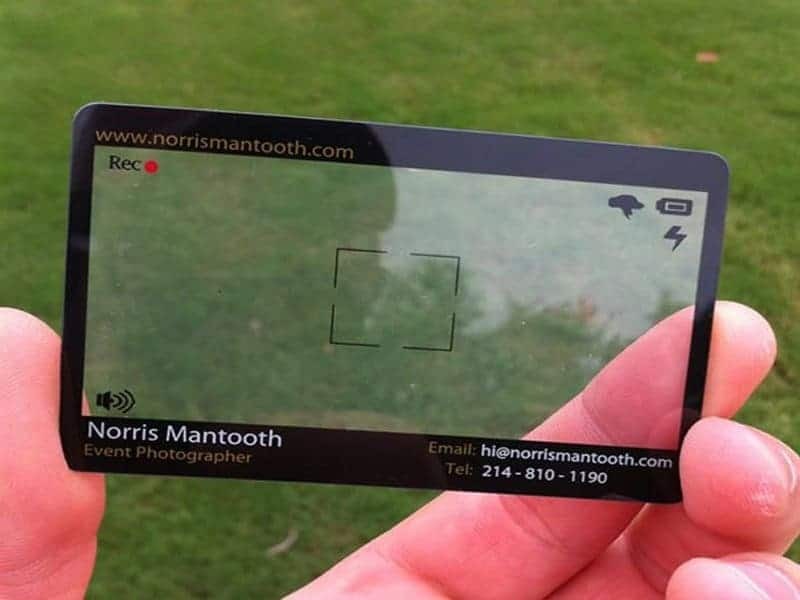 This event photographer converted his business card into a realistic looking viewfinder. The transparent surface makes the entire gimmick highly effective. Making a statement about your business is not easy, but this fitness instructor managed to do so with great ease. The message is nearly unreadable in its original state, but with a little bit of stretching it becomes extremely clear. 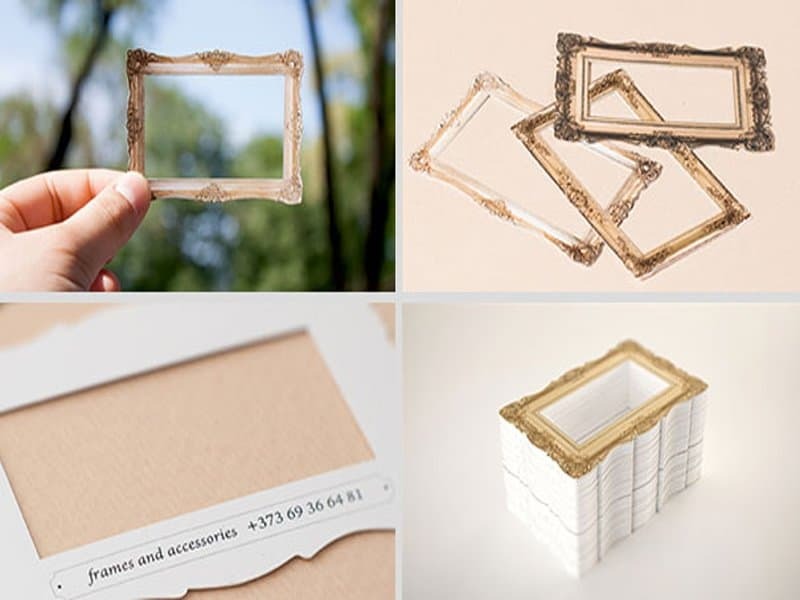 This is an elegant solution for a photo frame business. The versatility of the idea shines bright when you use different frames for different cards. If your business is operating in an unorthodox field, it is best to highlight that as much as possible. 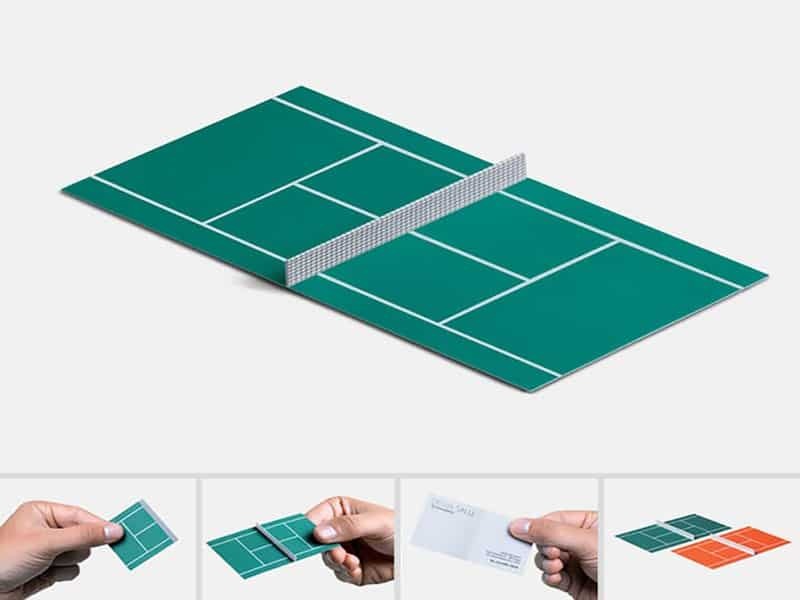 This tennis specialty store did just that by creating their card around the service their business offers. 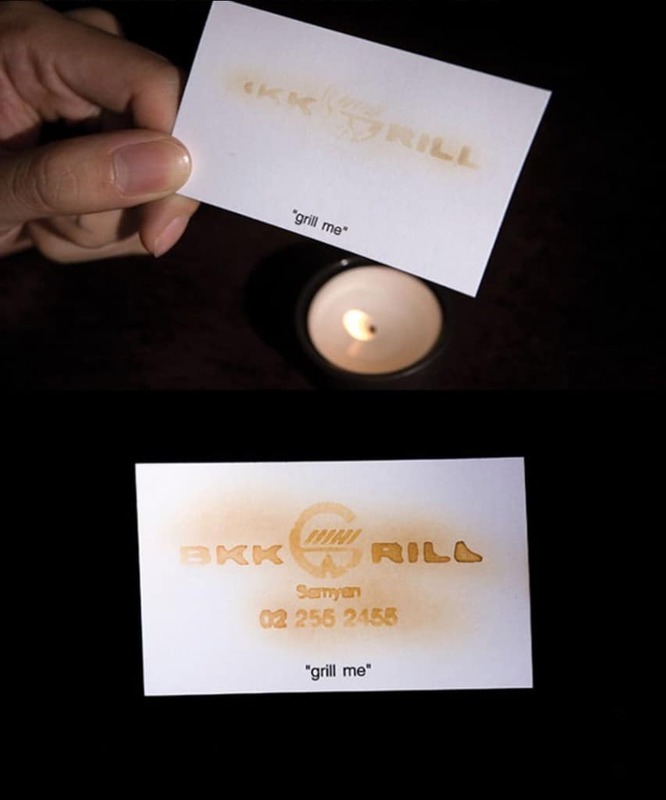 This unique business card for a BBQ and Grill house relies on an old magic trick to make an impact. The level of detail used to create the card makes it stand out in the long run. 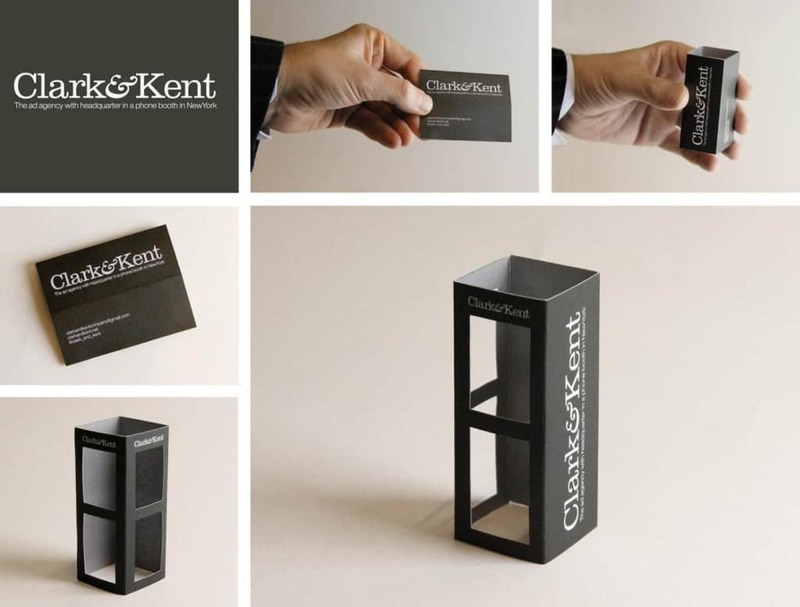 Utilizing both sides of your business card is another great idea to maximize the impact on the desired audience. This business analyst managed to highlight on two vital services he provides by using both sides of his card. Creating a theme for your card is another great way of making it stand out in a heap. 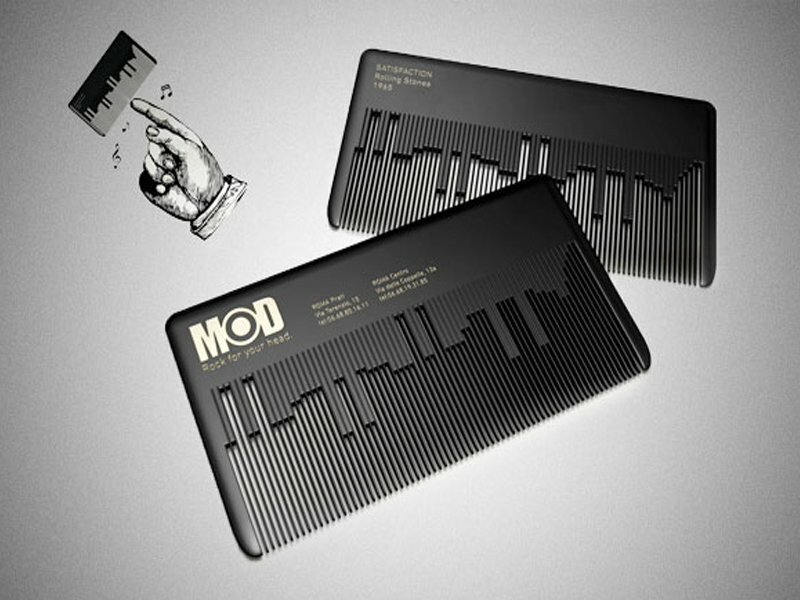 This rock themed comb has many great elements to it and is definitely hard to forget if you are a fan of the genre.